With our fifth year anniversary coming to a close, we decided to take a moment to showcase some of the thoughts and feelings of the staff that have been a part of MangaGamer over the years. This one comes from BдTMдN, one of the more recent additions to our translation team, who’s currently working on revamping one of our old translations. Five years. Feels like it’s been so short yet feels like it was so long ago. At that time I was selling Japanese style furniture in Canada from an south east Asian island state. Teaching how to copy-write and efficient experimental models for SEO. Living behind a mom and pop owned BBQ restaurant with my good friend… He was the son of a banana harvester that built his own blacksmith workshop to produce high quality harvesting knives. I was supporting myself through college with my father helping when things had gotten tight. From this experience I learned hunger and drive. After college I returned back to the US to find work a new position and spend time with family. Working for an interior design and remodeling company for a few months I then found a position teaching in China. It’s quite surprising how knowing kanji makes it so much easier to understand and pick up Mandarin Chinese. So fast-forwarding two years I find myself in Hong Kong faced with Cantonese and the differences between the two dialects are like comparing Spanish and Portuguese. Thankfully the majority of the Hong Kong peoples are versed in both Mandarin and English. It truly was a wonderful place and I hope to go back there some time. I did quite enjoy the mix of English influence and Chinese heritage. I’m quite new to MangaGamer in many senses of the word. I had heard of them before but it was only through a friend of a friend that I became affiliated with them. Really, I never expected to stay very long with them since I was called in for assistance on Imouto Paradise. I was surprised with the community into which I was brought. I have grown to enjoy their knowledge, thoughts and ideals. There are quite a few characters running MangaGamer and they all have their own niches and preferences. I do not know much about how things have developed in the last five years here at MangaGamer but I do have the pleasure to work on a product that had begun at that time. Quite a few know of the series thanks to the anime adaptation and others know of it from the radio broadcasts. Mayhaps there are others that know of it’s origins as an original fanfic on 07th expansion‘s website or their later visual novel adaptation. 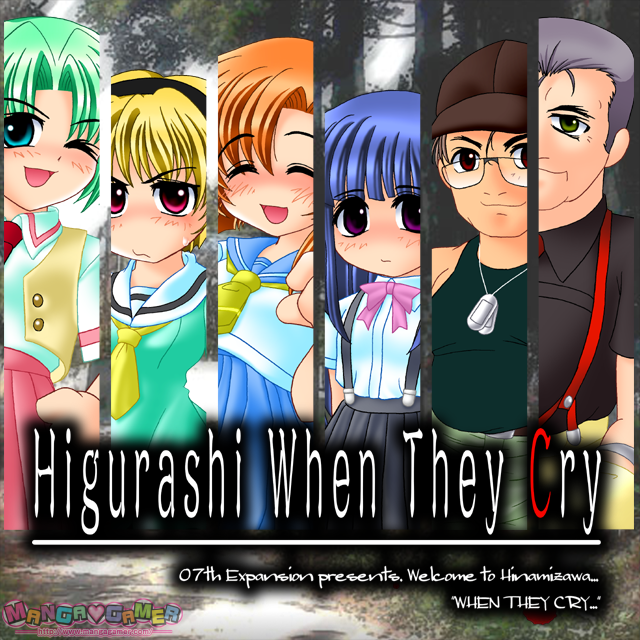 Higurashi: When they Cry. The language used in Japanese is quite poetic and artistically expressed. As the story is set in a rural village there were often references to products and people that have had little penetration into the west. The personalities of each character and their isms were unique. The lady-like yet crafty Satoko, the timid yet eccentric Rena, the adorable Rika, the bad-boy Keiichi, Mion the leader of the gang, and the rest of the cast each with their own quirks. Trying to preserve each of them in English has been quite a struggle. The nuances in Japanese like using sound effects to describe reactions, adjectives that can make up entire phrases, sayings based off Chinese proverbs, and slurring words to make them sound cuter have also made this a wonderful piece to be assigned. Ahem, so after that I was told how the standards of MG weren’t as high as they are now and the work done to improve things overall. The reforms, reassignments, and generally how things were turned around through reaping the souls of ba… I mean building up infrastructure. I felt that part was the most impressive and appreciate all the hard work put into making things better. Even thought I wasn’t around to see the improvement. I’m pretty sure it was amazing. Yes. Thanks for your work! Quick question though, I thought YukkuriS was translating Imopara? From what I can tell, YukkuriS was the lead translator, with BдTMдN assisting with additional translation. Ryukishi07 certainly has a unique style of storytelling (I should know), and it can be quite a challenge to express what he tries to convey, especially when he goes into the more abstract. 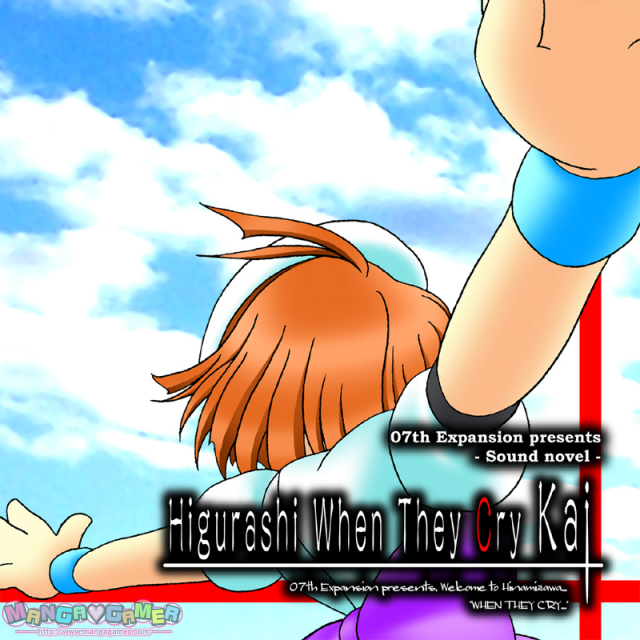 So best of luck to BдTMдN… I look forward to seeing Higurashi being available in English in a more readable form.